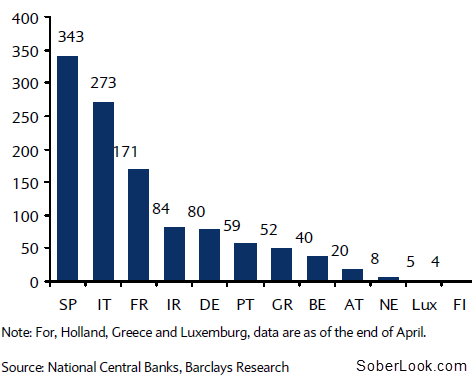 Here is a nice chart from Barclays that shows how much the various nations' banking systems rely on ECB funding. The data is as of the end of May except for three countries. The bulk of this is via LTRO (3-year) loans. Spain's banks however also tapped MRO (short-term) loans in May because the 3-year LTRO is not currently available and banks had to shift funding from private sources (deposits) to the central bank. Given that all of these loans are collateralized, some have asked where do banks get this seemingly unlimited amounts of collateral. The answer is that once banks run out of assets that are "ECB eligible", they create new collateral with the help of their governments (as discussed here and here).